According to ORINFOR, J. P. Nsengimana the Ministry of Youth & ICT of Rwanda, will visit the Kigali International Airport to see the use of ICT in service delivery. In this last dedecade, the Governement of Rwanda invested in the ICT, with the goal that Rwanda becomes an ICT hub in Africa (The Singapore of Africa). Since 2010, the Kigali Airport Terminal has been upgraded. Flight Information Display system (FIDS) have put in service, giving to passengers, some informations about flights status. It was necessary due to the growth of Air Traffic passengers. the status of the flight, such as "Landed", "Delayed", "Boarding"
In 2012, after four years of paper work, Kigali Airport launched the first Automated Passenger Clearance System, in the region. 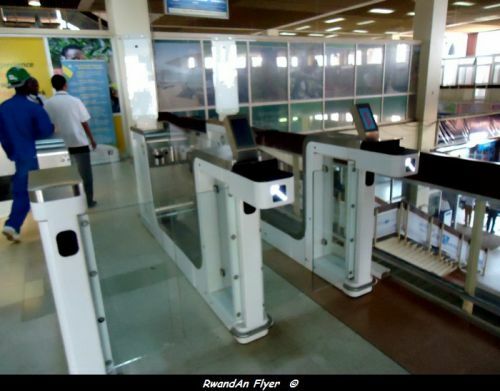 With the arrival of the gates, it will take only 12 seconds to clear a passenger, while it takes between 40-60 seconds for the normal procedures, according to the Immigration IT Engineer Eric Byukusenge. The system will accelerate passenger clearance and reduce queues on arrival at the airport. On "the security side" a Closed-circuit television (CCTV) system, which use the video cameras to transmit a signal to a specific place, and a vehicle parking automation have also upgraded.